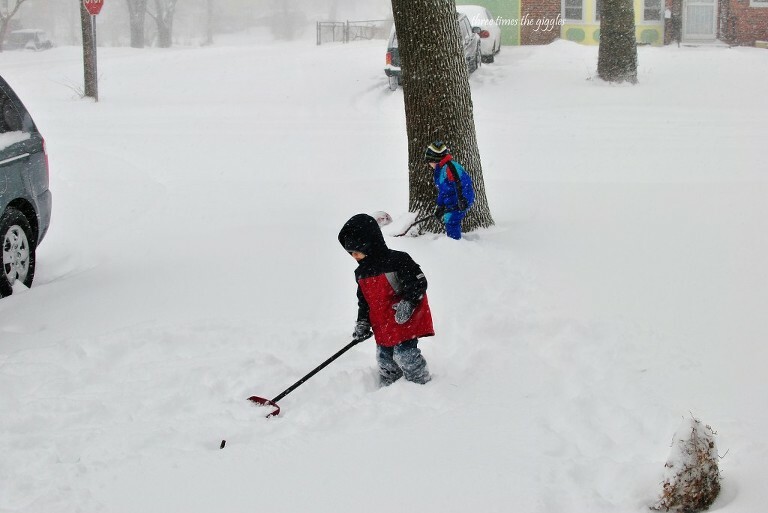 The boys have a snow day today. Again. They need to get out of this house and be with other kids and I need the break from the constant “no” or “stop that” I’ve been saying for the last week and a half. *sigh* We’ve had some major behavior regressions in the last couple of weeks, but we’re not sure if it’s because of the arrival of Lily or if it’s because they’re tired of being stuck at home or if it’s a mix of the two. Honestly though, there’s enough behavior issues to generate an entire blog post, so I’m not going to get into it on this one! That’s the view from our driveway. Snow, snow, everywhere. 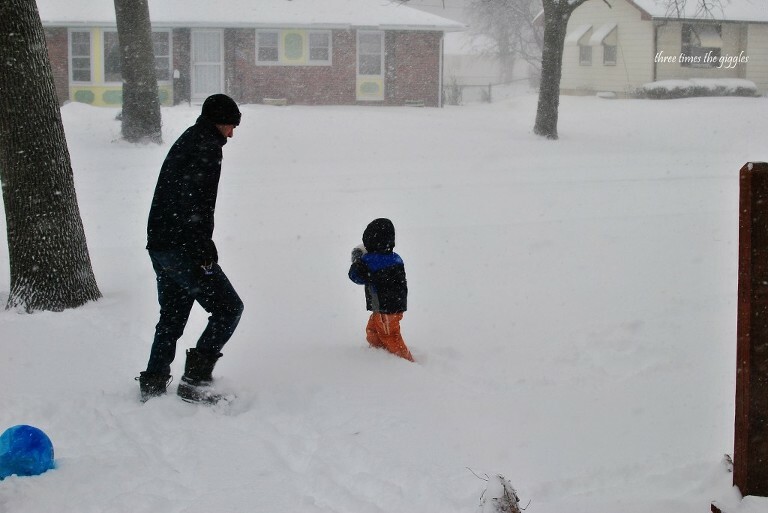 I think we got around a foot of snow, but it’s hard to tell because of all the drifting we had. 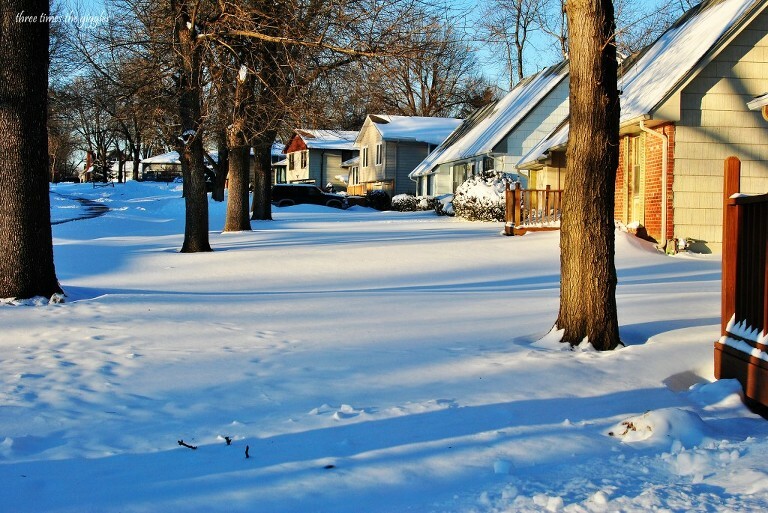 I do love the clean look of the untouched lawns, but I’m so over the snow and frigid cold! This snow hit us on Tuesday. I begged Nick to come home early from work before the blowing got really bad. He finally got home around 3pm and said he was pretty much the only car on the road. Such a tough Vermonter 🙂 After he got home the boys begged to go outside, so we bundled them up and the boys all went out to play. Looks cold, doesn’t it? 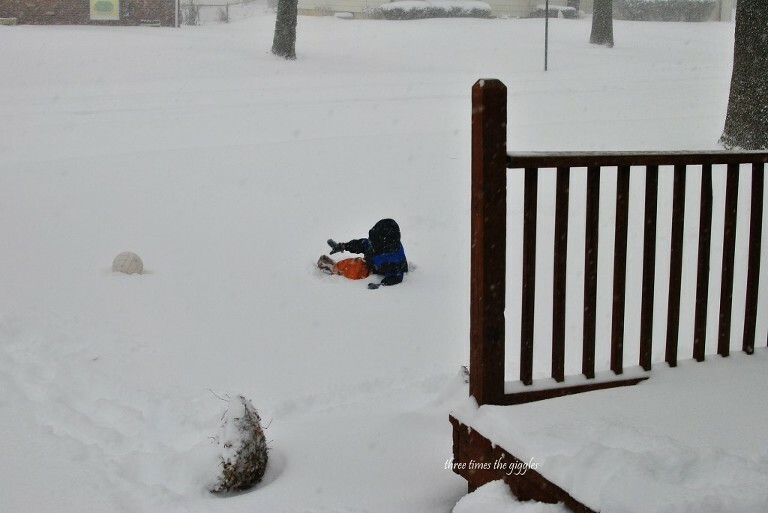 Snow still pouring down, wind picking up and temps in the single digits. Fun stuff! I feel like Nick’s posture here just shows how miserable it was outside. There’s a reason I was taking pictures from inside! Plus, someone had to stay in with Miss Lily and I was willing to take one for the team and do that. Oh, and I took the chance to take more pictures of her (of course)! Look at that munchkin! 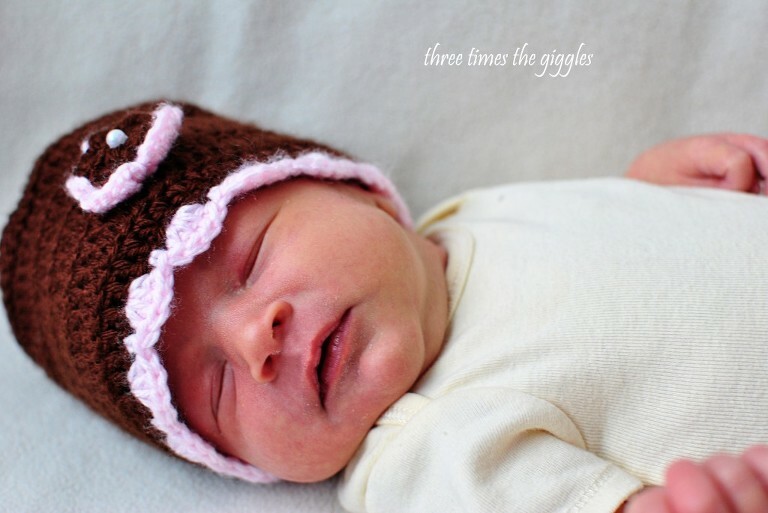 She’s modeling a hat that was given to us (along with matching booties) and can be bought from this Etsy Shop. So all this stuck-in-the-house time has motivated this mom to allow things I wouldn’t normally be a fan of… Yesterday I let the boys eat lunch under the table. They thought it was awesome! Know why I had them eat under the table? Because the chairs weren’t usable. While the fort was awesome to play in and a great distraction, it was a bear to clean up last night! Bottom line – I’m ready for spring. I’m “over” winter and snow for this year. I want a spring like day so we can all go to the zoo. I want a spring like day so that I can open the back door and let the boys run around the yard. Winter, you’ve made your point and now you can leave. In unrelated news, yesterday Lily and I had doctor’s appointments. Lily had her final weight check and is now over her birth weight (she was 7 pounds 12 ounces yesterday)! Hard to believe she is 2 weeks old today (and today is also the day we had the c-section scheduled for). I just had my 2 week post-op appointment, and you c-section women will all be thrilled to know my incision site is already vanishing and hard to find. 😉 As the doctor put it, I just have awesome skin when it comes to healing. I wish I had awesome skin when it came to tightening back up! The grass is always greener, right? Speaking of Lily, apparently her birth has generated a lot of blog traffic! I jumped from about 10,000 page views in a month to 17,000 page views in a month!